The Yarn Thing Podcast with Marly Bird was the first crochet podcast on iTunes and to this day is the only podcast (that we know of) that talks about knitting and crochet equally. Starting in 2018, the audio podcast is now a video podcast! Please, join me for a live podcast on the Marly Bird YouTube Channel. WHAT CAN I EXPECT FROM THE PODCAST? 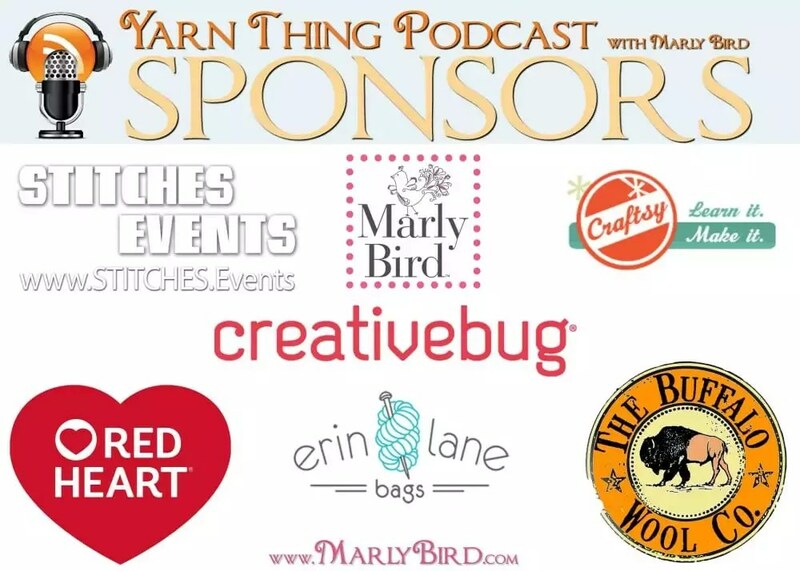 The Yarn Thing Podcast with Marly Bird (sometimes called Yarnthing) is dedicated to connecting knitters and crocheters together. I interview guests in the industry and sometime just do a show about my own life experiences in this bi-crafty world. Oh ya, I also laugh…A LOT! I try to keep a standard schedule of every Tuesday at 10am MST, but there are times when I have to move an episode to accommodate my travel schedule. If you want to be sure you are NOT missing an episode, follow the Marly Bird Facebook Page as we always update that to let you know about podcast events! Also, make sure you hit subscribe button on the Marly Bird YouTube Channel, and click the little bell so you get notified whenever I go live! I HEARD THERE ARE PRIZES…IS THAT TRUE? Absolutely! We are lucky enough that all the guests that join me on the podcast typically offer a prize to ONE live listener and to ONE commenter on the show notes after the show. Each episode I go over the details of how to win but essentially, if you are lucky enough to listen live be sure to listen for the prompt to leave a comment on the LIVE VIDEO FEED. One random winner is chosen from those comments during the show. If you didn’t win live or if you didn’t get a chance to listen live there is still a chance for you to win a prize! The guest of the show will give you a keyword or phrase to use in a comment that MUST be left on the individual episode’s show notes right here on MarlyBird.com. Once you leave your comment you just sit back and wait to see if you are the lucky random winner that is chosen about 2-4 weeks after the original air date of that episode. Note: the comment area is at the VERY BOTTOM of the show notes so be sure to scroll clear to the bottom. Any other details or rules regarding the prizes are often shared during each podcast so listen and see if there are particular restriction…and last but not least…Good Luck. CAN I STILL LISTEN TO OLDER AUDIO ONLY PODCAST EPISODES? You can also find all of the past episodes in the Show Notes section of the website. Each show has a blog post with links to things that were talked about along with a link to the recording of the episode.